Switzerland: The Land of White-Only Chocolate? 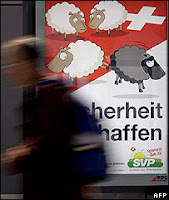 The BBC reports that “A political row has broken out in Switzerland over a campaign poster from the right-wing Swiss People’s Party….” The poster that everyone is mad about is pictured here, because I couldn’t find a picture of the other one: it’s three white sheep kicking a black sheet off of Switzerland’s flag. Apparently, Muslims aren’t “Swiss” enough for the Swiss People’s Party. Not even the Muslims who were born in Switzerland. I don’t think Mr. Freysinger has ever been to Spain (part of Europe), where Muslims ruled for something like 500 years, and left behind some great architecture, which includes minarets. And were they ruling using a “political and aggressive Islam”? Well, why don’t you ask the Jewish minorities who lived peacefully under Muslim rule in Spain until King Ferdinand & Queen Isabella purged the country of non-Christians starting in 1492 through the use of The Inquisition?